Julie, Dr. Davis, Elizabeth, Dr. Walker, and Melissa pose with our gifts for the second family KAH supported this year! Julie and Kelly pause for a selfie before making the trip to the YMCA. For the past several years, the staff of Kingsbrook Animal Hospital in Frederick, MD has “adopted” a family for Christmas. These families are in unfortunate situations and may not have a visit from Santa without our help. This year, after signing up to support a family with 4 children, KAH technician Julie was approached by a liaison to the Frederick County Public School system about a second family in need. Of course, our staff quickly jumped at the chance to bring Christmas cheer times 2! KAH technician Julie’s kitty Calvin gets in on the wrapping action! Kelly helps the YMCA staff unload all of the gifts. We gathered and wrapped gifts for each individual member of the families over two weeks. Every staff member contributed! On December 21st ,it was time to deliver the presents. We loaded up Kelly’s sleigh—er, car, with lots of packages to deliver to our first family. Kelly and Julie delivered a full Christmas for this family of 6, and the family advocates who collected the gifts were overwhelmed. Each individual had tears in his/her eyes, and it was an emotional moment for Kelly and Julie as well! Meanwhile, Melissa and Dr. Walker loaded up another car with gifts for our second family. The scene was much the same at this drop-off—the attendants were so excited that this family of 4 would be able to have a real Christmas after all! Each and every member of the KAH staff is so grateful that we were able to make a real difference in our community this holiday season. From all of us to all of you, have a wonderful holiday! Kelly, Dr. Walker, and technician Melissa load up the gifts for our second family! Julie poses with the YMCA Head Start employees alongside all of the gifts we donated. This entry was posted in community, Frederick MD, Holiday, Kingsbrook Animal Hospital, veterinarian and tagged Frederick MD, Kingsbrook Animal Hospital, Veterinarian on December 23, 2016 by yourfriends. There’s no place like home for the holidays! Traveling with your pets can be a very exciting adventure…especially during the winter months. When traveling with pets during this holiday season there are even more things to consider too! Having a first aid kit on hand with some basic supplies is a great idea while traveling. animal hospitals along your route in the case of a big accident can be very helpful, or at the very least, put your mind at ease. trip, you can present them with Fido’s vaccine history. KAH CSR Kelly’s sweet Wyatt loves to ride in the car! Use a seatbelt or tether to keep pets safely anchored in the backseat. Having your pet sit on your lap or ride ‘shotgun’ with you may seem like a good idea, but slippery conditions can be unpredictable due to the weather changing so quickly during this time of year. Having your pet secure in the car is the best option for their safety (and yours)! A kennel, carrier or pet-specific seat belt is a great way to make sure that they don’t go flying in the event of a car accident or sudden stop. Providing toys, chews or treats is a great way to make sure your furry family member is occupied during long trips. Making things like a Kong Pupsicle is a great way to keep Rover busy for a while! (soak their kibble in water, smush it into a Kong toy then freeze- VOILA!). You may want to avoid things like stuffed animals that can be destroyed and ingested since you’ll be driving and unable to keep a continuous eye on them. winter time- nothings worse than a wet dog and 8 more hours to drive! This entry was posted in cat travel, cats, Dog, dog in car, Dog ownership, dogs, Frederick MD, Hazards, Holiday, Holiday safeguards, Kingsbrook Animal Hospital, Pet travel, pets, travel, veterinarian and tagged cats, dog, dogs, Frederick MD, holiday, Kingsbrook Animal Hospital, pets, travel with pets, Veterinarian, Veterinarian in Frederick MD on December 20, 2016 by yourfriends. Blog star Johnny Blaze is back with a message for all cats everywhere: don’t eat holiday plants! and unplugging your electrical cords when pets are not being supervised. KAH client service rep Kelly’s “cousin” Buddy decides to decorate himself for Christmas! Many cats are attracted to garland and will chew or even ingest pieces of it. Tinsel, ribbon, and strings– Few cats are able to pass by this stuff without stopping to bat, chew or ingest it! In fact, strings are one of the top foreign bodies seen in cats year-round. Liquid potpourri or candles– These candles and warmers can help our homes smell wonderful during the holiday season and throughout the year, but do pose a burn risk for cats. If you have a counter-surfing cat then please unplug or blow out while the cat is not under your direct supervision. Finally, some cats find it thrilling to attempt to climb the Christmas tree. Create an unpleasant barrier (tin foil, double-sided sticky tape) around the base of the tree to help deter them from climbing. It is always a good idea to securely anchor your tree as well- just to be safe. Allowing a “safe zone” for your feline friend to retreat to as needed where it is quieter and away from the festivities can provide them with a much appreciated break. While you cannot always prevent emergencies from happening, we hope this list helps keep your pets safe and happy during the holidays. It can be very helpful to have your veterinarian’s phone number, as well as a local emergency hospital’s number, pre-programmed into your phone to be prepared in case of emergency. The veterinarians and veterinary staff here at Kingsbrook Animal Hospital in Frederick, MD wish you and your fur babies a happy holiday season! This entry was posted in cat, cats, Frederick MD, Hazards, Holiday, Holiday dangers, Holiday Hazards, Kingsbrook Animal Hospital, veterinarian and tagged cat, cats, Frederick MD, holiday hazards, holidays, Kingsbrook Animal Hospital, safety, Veterinarian on December 13, 2016 by yourfriends. The 2016 holiday season is here, and with the festive spirit also comes some special consideration for dog owners (come back next week for Holiday Hazards for Cats). What would the holidays be without all the tasty treats?! Many people are giving or receiving baked goods during the holidays, which depending on the ingredients can pose a health risk to your fur babies. Most of us know by this point to watch out for chocolate and xylitol, but some others we might not be quite so familiar with are: raw bread dough, grapes, raisins, alcohol, and onions. Overindulgence, while often originally well-intentioned, can cause severe gastrointestinal upset that may require your pet to be hospitalized. You can try to prevent this by pre-emptively giving out some of your dog’s treats or dog food to guests to eliminate those fatty, spicy, yummy human foods and bones. Holiday plants- poinsettias, mistletoe, holly, lilies, and pine trees- all help to fill the home with bright colors and festive smells during the holiday season. Mistletoe can be very toxic to animals. Poinsettia is a holiday favorite most people falsely think of as being extremely toxic, although it can still be quite irritating to our pet’s GI systems. Be sure to check to make sure any water additive for your Christmas tree is pet friendly. There are often large numbers of visitors throughout the holiday season, and pets can consume medications that family and friends have brought with them. Dogs can be very curious and suitcases and luggage can be an interesting new thing for them to nose through and many are not above chomping or eating medications. Many medications safe for humans can be dangerous for pets. Even pet medications can be hazardous if the pet overdoses! People often have their medications with them- sometimes even all the medications mixed together in a bag or a daily pill organizer. Keeping all medications closed in a cabinet can help keep you dog safe. Also, asking visitors take medication in a room separate from the pets can be prudent too- this way if a pill is dropped it can be located again before your dog has a chance to eat it. Traveling with a list of your medication’s name, milligrams, and the number of pills you have can be extremely helpful in an emergency ingestion situation. KAH assistant Robin’s Jacoby proves that curiosity isn’t just for cats! Garlands, ornaments, and lights can be hazardous to unsupervised furry friends. Finally, ornaments, lights, and electrical cords can be enticing for your four legged friends to play with and/or chew. The dangers associated with your dogs’ playing with these can include: lacerations, electrical shock, and foreign body ingestion. While you cannot always prevent emergencies from happening, we hope this list helps keep your pets safe and happy during the holidays. It can be very helpful to have your veterinarian’s phone number as well as a local emergency hospital phone number pre-programmed into your phone, so if there is an emergency you are prepared. The veterinarians and veterinary staff here at Kingsbrook Animal Hospital in Frederick, MD wish you and your fur babies a happy holiday season! This entry was posted in Christmas Hazards, Dog, dogs, Holiday, Holiday dangers, Holiday Hazards, Kingsbrook Animal Hospital, Safety Tips, veterinarian and tagged dog, dog safety, Frederick MD, holiday dog, holiday hazards, holiday safety dog, Kingsbrook Animal Hospital, Veterinarian on December 6, 2016 by yourfriends. The veterinarians and staff of Kingsbrook Animal Hospital would like to wish you a safe and happy holiday season. This entry was posted in Holiday on December 25, 2009 by yourfriends. 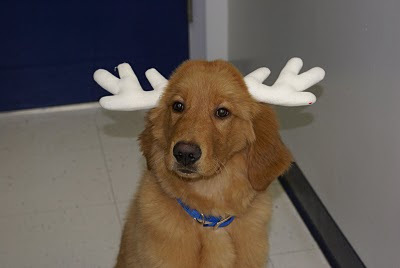 Murphy was in for a check up to make sure he was healthy in case Santa needs his help delivering gifts tonight. This entry was posted in Holiday, Murphy on December 24, 2009 by yourfriends.